We’d love your help. Let us know what’s wrong with this preview of Being Right Here by Nuden Dorje. This treasure text of Nuden Dorje renders a very clear and authentic account of the view and essential meditation of dzogchen, the practice of nondual experience. The presentation is in the Men ngag style, a personal instruction detailing the author's own realization in a manner both beautiful and deeply meaningful. 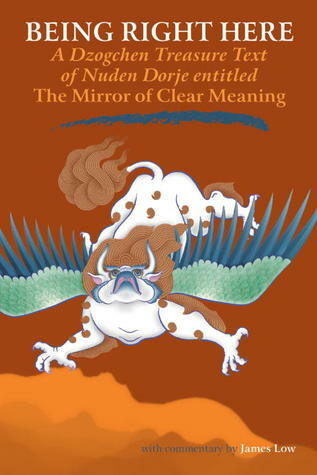 Short verses show, with pithy clarity, how the various as This treasure text of Nuden Dorje renders a very clear and authentic account of the view and essential meditation of dzogchen, the practice of nondual experience. The presentation is in the Men ngag style, a personal instruction detailing the author's own realization in a manner both beautiful and deeply meaningful. Short verses show, with pithy clarity, how the various aspects of dzogchen fit together. The text provides both an authentic portrayal of the practice and a clear instruction in how to apply it. To ask other readers questions about Being Right Here, please sign up. ‘Being Right There’, a Dzogchen text with commentary by James Low, is a decent example of the Tibetan tradition. This work, like many other Tibetan studies, includes lengthy explanations of the psychological sides of meditative thinking and process. As one who practices Zen, I find this a great parallel study as to what specifically goes through the mind of the contemplative, even though Zen is a different school of thought, with its own emphasis. There are also examples of contacting with dire ‘Being Right There’, a Dzogchen text with commentary by James Low, is a decent example of the Tibetan tradition. This work, like many other Tibetan studies, includes lengthy explanations of the psychological sides of meditative thinking and process. As one who practices Zen, I find this a great parallel study as to what specifically goes through the mind of the contemplative, even though Zen is a different school of thought, with its own emphasis. There are also examples of contacting with direct experience that parallels a Zen type of experience (Being Right There, 95). Use of objects as a way to deepen the practice of concentration is also a part of the Tibetan tradition. But objectification can lead to being trapped in samsara (the realm of the senses), as this is also true in everyday life (110-112) and Low conversely illustrates that the emphasis goes back to he mind (113-115), which should be the ultimate “focus”. A very good definition and ethical connection to illusion is demonstrated in Verse 31 (128-133). As so often happens in the West, misconceptions as to what Buddhists mean by “the world as illusion” run rampant and recycled over and over. In just a few pages, this concept is dealt with by Low fairly well. And to follow this up, Verses 33 (137-138) and 34 (139-140) teaches that rather than avoid the world or being nihilistic, facing life directly (even to recognize and openly confront our mortality) with all of its many phases creates not only a better perspective, but also a “proof text” for the reality the Dharma (teaching) is trying to convey. “Non-existent and existent things are both grasped at as real” [see Verse 17, 87:]. The Christian notion of God is a good example of the non-existent. God as an empty signifier can be defined anyway you want-there is nothing visible or tangible to contradict your definition. If you have small children you get used to lying down on the bed with them and beginning: “Once upon a time…”Something comes into your mind and a little story develops. The reason we can do this is because all our lives we do nothing but tell stories to ourselves. We re good at being seduced by narrative and seducing other people with narrative. The are a few things to point out. Up until this paragraph, much of the teaching is direct, extensive (as much as this commentary has been), extensive, and exhaustive. But here, there is 1. A reductionist statement regarding Theology, and in particular, mono-theistic, distinctively Christian notions of Theology. Not only is this a simplistic understanding of over two thousand years of Theological inquiry and Church history, it also narrows and does not represent other forms of Theology (I.e. Animism, Polytheism, etc.). 2. There are a few postulations embedded in this paragraph. But they are never addressed in detail, as Low does with most of the book. Things like the concept of God is a fair thing to discuss and debate, but to say that Buddhism necessarily makes a definite conclusion regarding the existence or non-existence of God, or that Buddhism can or should even be considered through the lens of Atheism or Agnosticism (see Professor Kenneth K. Inada’s essay, “Some Basic Misconceptions of Buddhism”), is not only misleading, it is incorrect. Both Buddhism and Christianity is a complex set of ideas, with two plus millennia of history of thought to be rendered a one paragraph summation and assumption. 3. The last portion of the paragraph implies that myth is synonymous with untruth. Yet, as in the distinction between the Pali texts, which are assumed to be directly connected with the historical Buddha, that is, Siddartha, and the Tathagata, or the universal Buddha (especially in Mahayana schools), and yet, it is argued that the Dharma does not suffer with the images (mythic) of thousands of Arhats, Bodhisattvas, and the like. A similar distinction can be made with the difference between Jesus, a historical figure, and His Parables. Buddhists and Buddhism utilize the use narration as well as the authors of the synoptics, with no damage to the essence of the thought that guides such narration. Ancient text, modern commentry. Cuts to the heart of Non-Duality in easy to read short bursts.